This Sunday, 5th October, you have a chance to come and meet other people who care about Manchester’s future, and to work with them on a series of concrete, albeit odd, projects. It’s not every day that citizens gather and …work unpaid at creating a bureaucratic plan for a Manchester City Council committee, but that’s what we’re going to do. Here’s the very short back-story. 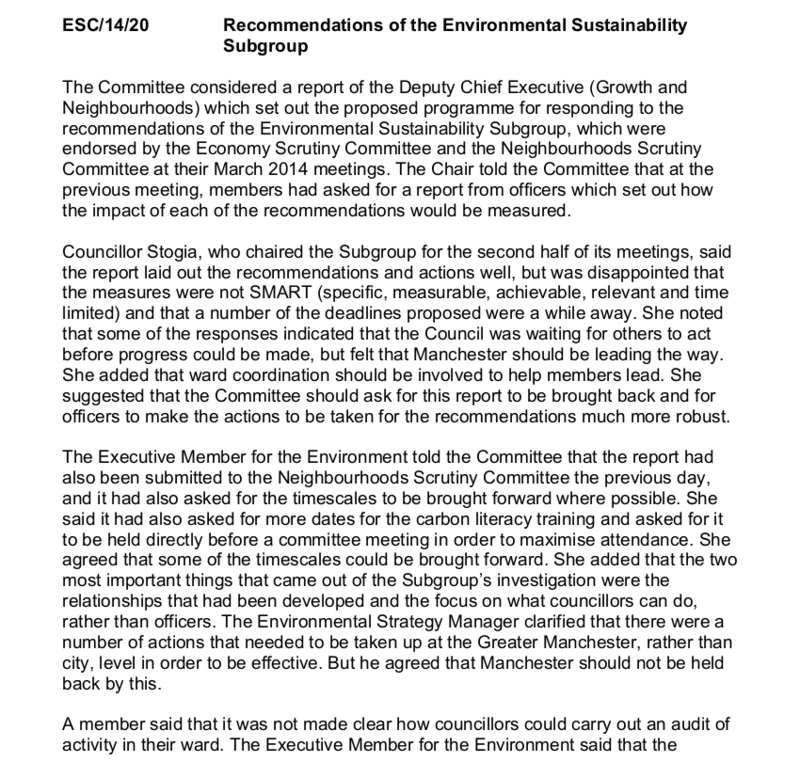 In March 2014 18 recommendations about how the Council would “do” sustainability differently were agreed (They are at the bottom of this post). Council officers were asked to make an “implementation plan” to turn those 18 recommendations into reality. In June they presented their version – and were told to go away and beef it up; councillors felt that the plan wasn’t sufficiently “SMART” (specific, measurable, achievable, realistic and time-framed). They presented a re-done “implementation plan” in September. And were sent away AGAIN by the Economy Scrutiny Committee! (MCFly was there – blog post to follow). This leaves citizens of Manchester who care about its future with a simple choice. We can wait another 3 months before the third version of the implementation plan comes back to Neighbourhoods and Economy Scrutiny Committees, with no guarantee that it will be acceptable to the councillors. We can write it ourselves, and then present it to councillors. Sunday’s meeting is partly about doing that. Alongside that rather weird goal, we will also be teaching each other video-making, public speaking, how to submit Freedom of Information Act Requests, you name it. There’s no need to book, just bring yourself, your ideas, your friends. It’s happening at the Moss Side Community Allotment, corner of Bowes St and Caythorpe St, Moss Side. We’ll be there from 2pm to 5pm, but you can pop in for however long you like. Coffee, tea and biscuits will be provided! If you CAN’T come, but want to be involved, please get in touch, via environmentalscrutiny@gmail.com. And below are the 18 recommendations of the Environmental Sustainability Subgroup, which were accepted in March 2014 but are STILL waiting for a “SMART” implementation plan. If you have any ideas about implementation for any (or all!) of these 18, please get in touch. When the Community Strategy is reviewed, more consideration is given of what makes for “good growth” for Manchester. To include the support and advice from local experts and interest groups such as the CLES (Centre for Local Economic Strategies), CRESC (Centre for Research on Socio-Cultural Change), the Tyndall Centre, Steady State Manchester and MERCi (Manchester Environmental Resource Centre initiative). That follow up work includes consideration of the economic impact of the green industry, including sustainable energy and the jobs market. To recommend that when Economy Scrutiny Committee considers how local people benefit from economic success, environmental benefits are included. To recommend that the Environmental Strategy team lead on influencing officers to consider environmental matters in all relevant decisions through ward coordination. To recommend that the Environmental Strategy team facilitate workshops for councillors to help them understand how they can make a difference and equip them with the skills and knowledge to work with groups and individuals effectively. For the workshops to include how councillors can use their links to social housing providers and other key partners and practical examples of changes that can be made. To recommend that councillors carry out an audit of all the work, projects and schemes in their wards on environmental and climate change action. To work with key local organisations such as social housing providers to do this. To recommend that the workshops for members should be used to support members in this. To circulate the CLASP (Climate Change Local Area Support Programme) Member Briefing Pack to all councillors. To recommend that, once Neighbourhoods Scrutiny Committee had looked at the sustainable food growth report, Economy Scrutiny Committee considers looking at the poverty and economic aspects of sustainable food growing. To recommend that environmental policies are strengthened through the Council’s planning process. To recommend that the Council continues to include environmental considerations when selecting a supplier, through the implementation of its Sustainable Procurement Policy. And that the impact of the policy is reviewed and that it is updated as required. To recommend that the Economic Development Unit, Corporate Procurement, Environmental Strategy and other relevant departments continue to implement the Council’s Sustainable Procurement Policy, using procurement as a tool to support sustainable economic development, including the achievement of environmental outcomes. To recommend that the Association of Greater Manchester Authorities (AGMA) and the Greater Manchester Combined Authority (GMCA) work with CLES to determine what proportion of their procurement budget stays within Greater Manchester, and considers revising their procurement policies to maximise this. To recommend that corporate communications and awareness raising on environmental matters should be improved. To recommend that officers investigate carrying out a campaign to raise awareness of how people can make changes to reduce their impact on the environment. This campaign should link to wider cultural and behaviour change activity by the Council and other key partners such as universities and schools. That the Council develops an energy policy which reflects the priorities identified in the investigation. To recommend that all Executive reports include consideration of the impact the decision has on the environment. To recommend that the Economy Scrutiny Committee monitor the implementation of these recommendations.